﻿ The Macro Tourist | HOW DID IT COME TO THIS? Oh F’ me. The end of western political civilization itself? Because Britain has decided not to be ruled by a bunch of bureaucrats in Brussels? You have to be shitting me. The scare tactics employed by the remain camp have gone too far. And if their union is so fragile that a country leaving, one that does not even share a common currency, can bring it all crashing down, then it probably wasn’t destined to survive anyway. I try to avoid discussing politics as all that should interest us as traders is what is instead of what should be, but in this case it might be difficult for me to hold my tongue. I strongly believe countries should not cede their sovereignty in any way to other countries. I am Canadian and as much as I love our southern neighbour, there are too many areas where our policies differ for us to merge together. Americans wouldn’t dream of adopting some of Canada’s more “socialistic” policies, and I couldn’t imagine giving them up. We have an extensive free trade agreement with the US, and we coordinate policies where our interests align, but any perceived advantages by merging are simply not worth it. So it’s not hard to see which camp I come down on in terms of Brexit. But whether I agree or disagree with Britain leaving the EU doesn’t matter one iota. All that matters is what the market believes. And suddenly the market is extremely concerned. And this no bid vacuum whoosh lower has happened when the ECB was busy writing monster blue tickets in the corporate bond market. I have been stressing that the Brexit outcome is not as bad as the market believes, but so far that has been an absolute terrible call. I am talking “forced to watch Toronto Maple Leafs hockey” kind of bad. Although I have read some well thought out pieces that outline the cost of leaving the EU, I still contend the sight of the needle is worse than the pin prick. Yet that doesn’t matter right now, as the markets are busy pricing in the worse. The market is no longer trading on anything but fear. But I do want to point something out. If the market was truly worried about Brexit hurting the British economy, wouldn’t the Pound be getting smoked against a stronger euro? Yet when I stare at the screen this morning, the pound is down 0.37% and the Euro is down 0.67%. The unwind is not occurring in Britain, but instead capital is fleeing the entire EU. 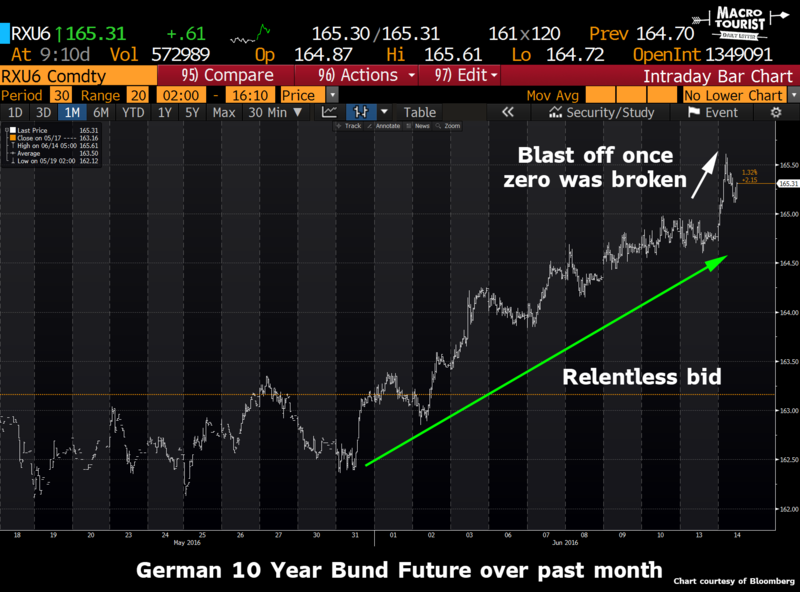 And that is why German 10 year bunds have broken below zero. German bunds are the ultimate European “riskless” asset. With all the scare mongering, capital has become extremely fearful. Now maybe I am wrong. Maybe Britain voting to leave the EU will prove the tipping point in this whole European monetary experiment. Maybe after June 23rd, it will all unravel astonishingly quickly. But I somehow doubt it. Regardless of the vote, I still contend it will be anti-climatic. Even a leave result will not change anything overnight. And then the long hard process of negotiating an exit will begin. But no money manager will have to sell an asset because of a worry about solvency. No one will be reneging on a debt. 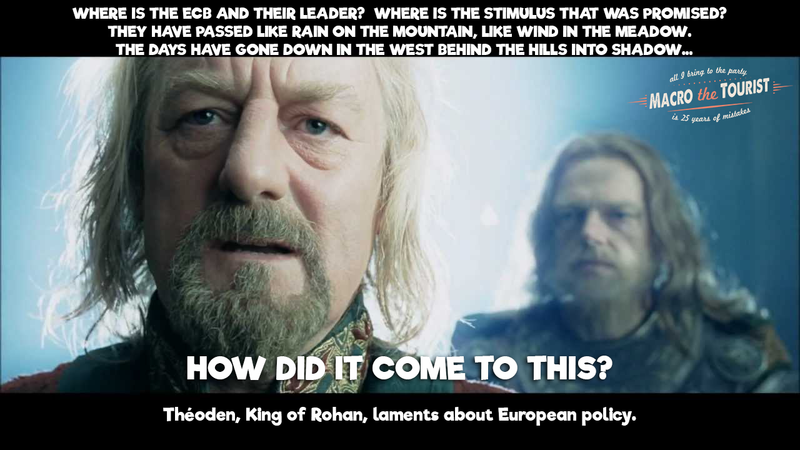 This is so much different than all the other European crises. And we have Draghi with his huge stack of blue tickets. 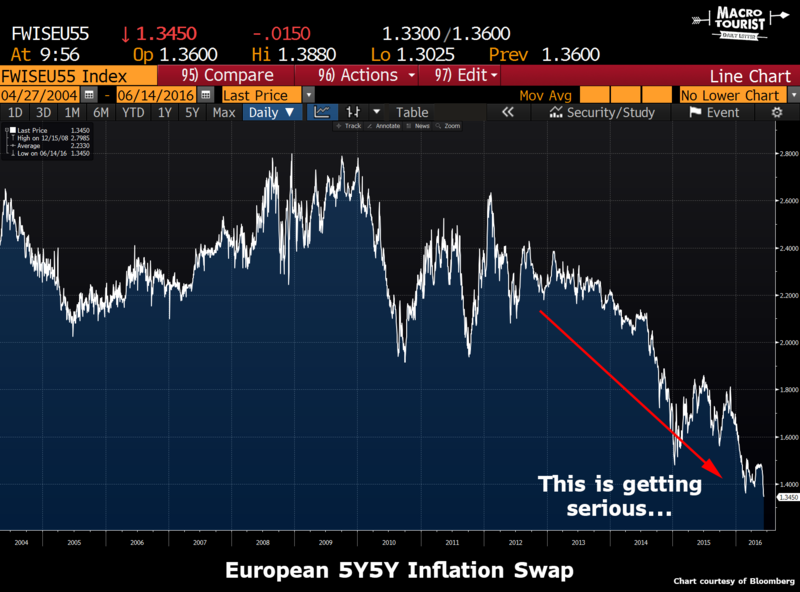 Although they deny having a plan for fear it might be leaked, you can bet your last Euro the ECB will not sit idly by while their beloved EU crashes. For that matter, there can be no doubt that all Central Banks have contingency plans. Right now, they are patiently sitting on the sidelines, waiting for their moment to pounce. But make no mistake, they are ready to act. There are simply too many signs of real stress in the financial markets for them not to be worried. This indicator is ticking at new lows. The fear of the deflationary vicious circle accelerating has to be alarming even to the Germans. 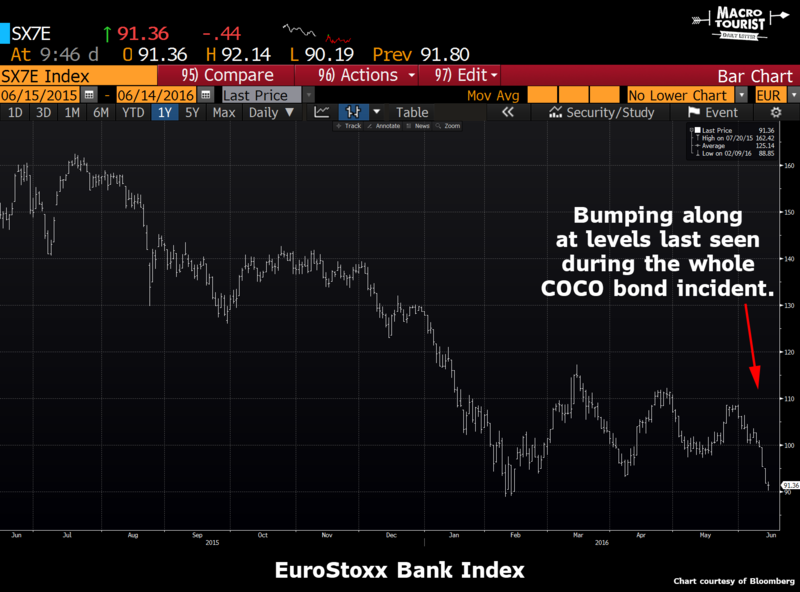 The Central Banks (including the Federal Reserve) are watching these developments closely. They are biding their time, knowing it is pointless to react before the actual June 23rd vote. In fact, given that most Central Banks are supportive of the monetary union, it probably makes sense for them help the remain camp by allowing markets to get as ugly as possible in the days leading up to the vote. 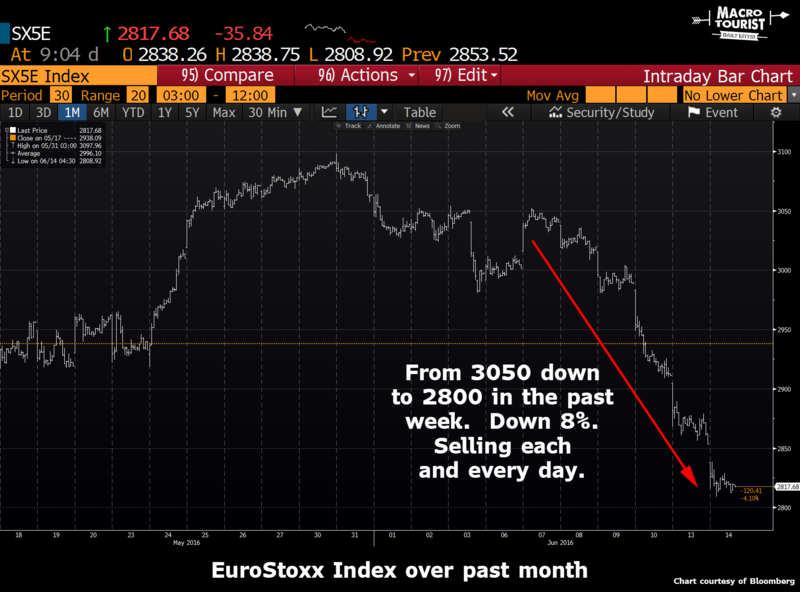 This fear of Brexit ends up paralyzing the entire market. I don’t know how the vote will play out, but I am confident it won’t be anywhere near as bad as the market fears. One of my buddies sent me a great tweet of a chart by Cyril Castelli. It is interesting how over the past couple of weeks, the VIX and the GBP volatility have diverged. 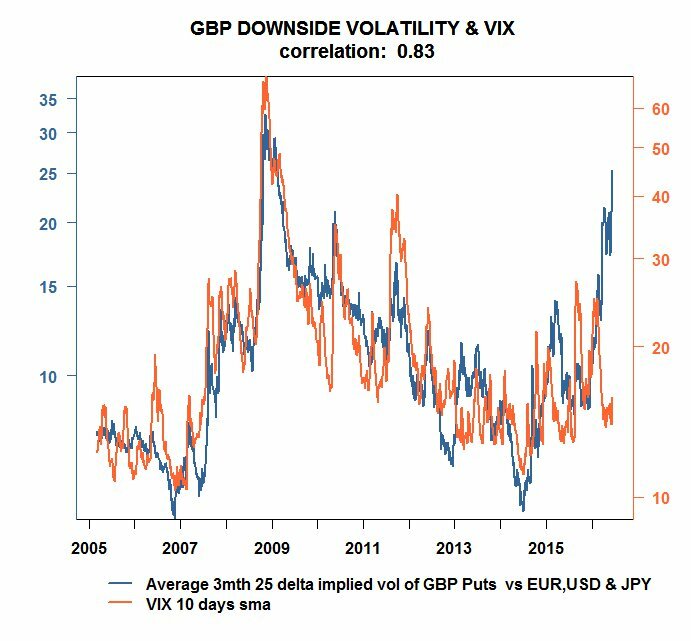 Although there is a good chance VIX is cheap, maybe pound volatility is too high? I know everyone will look at this chart and want to buy VIX, but at least sell some pound vol on the other side.